Great ideas spawn progress, but you may feel that you're doing more spawning than progressing until after the 20th. Then, fasten your seatbelt! It's finally your turn to step into the limelight. Allow ample time for relaxation, and concentrate on inner fitness from the 1st—20th. During this period, your meditations can be healing and may inspire a very clear vision about your future. Time away from the everyday grind can inspire a truly romantic experience. Travel to an exotic or fanciful place can help to open your heart, and if you're looking for love, you may find it away from your ordinary existence. The Moon on the 23rd emphasizes partnerships, and you may experience positive benefits through your partnership. Reaffirm your vows or make a new commitment on the 23rd, 24th, 28th, or 29th. Your professional associates provide exceptional support from the 4th—10th, although you may be left to your own devices when it comes to rectifying problems. 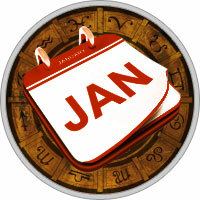 Mercury's retrograde from the 1st— 12th provides a good period to review your situation and complete old business. Get the blocks out of the way, because you're ready to launch something new and exciting on the 22nd. Legal affairs and contracts fare best after the 17th. Your ability to communicate your ideas, coupled with a good period for others to be open to what you have to say, promises to advance your position from the 22nd—31st.